In 2010, I lost 48 pounds. By the end of 2012, I gained it all back. Along the way, I lost myself. It would be easy to write off my journey as pathetic, to state that I lack real commitment or focus or desire. Yet to do so would not be a true telling of what having food as a “go to” is, an honest view of body image complacency or a peek into one’s fear of change. I once heard someone sum up that in making the choice to remain overweight, there must be something fulfilling occurring for the person—ease of habit, safety of hiding behind the pounds, evolution into martyrdom, maybe even added attention as everyone circles to “fix” them. I can say, “yes,” for the first three. Growing up as a dancer, food was a source of fuel. I didn’t have a concept of good or bad body image. I was lucky to be instilled, from my parents, with a strong sense of self and appreciation of what I’d been given. My body was my body—muscled legs and balanced curves. I knew of peers who were delving into the weight loss crazes of the moment. Those who feasted on diet Pepsi as nourishment in an aim to be Kate Moss thin. A friend who was anorexic. It was during junior year of college that my life turned the corner and the feasting began. I’d stopped my dancing regime by that point and entertainment centered around cheap, greasy food. Burgers? Check. Chips? Oh yeah. Cookies? Daily if I could. Mountain Dews were paired with late night studying. Belgian waffles were a staple for breakfast, lunch and dinner. Food became a comfort for any stress and the result blanketed me in layers like a cocoon. I graduated from college 50 pounds heavier. Yet my body was my body and I purchased larger clothes and rolled with it. A funny thing happened on the way to gaining the weight—everyone got silent. Now I bet if I’d picked up a nasty crack habit and become a skeletal base head form, they would have squawked. Or if I made it to the family reunion with patterns of track marks from a heroin love, someone would have eventually intervened. Not with food. Not with weight. It is one of the last silent taboos. Folks will talk about you—“She’s sure put on weight” or “That outfit isn’t fitting right anymore”—but they won’t talk to you about the why of what’s going on. Everyone bought into the pattern of silence and I continued the growing cycle. Change is a process. You can read loads of healthy living articles, see the tips, hear “thirty years from now” reality statements from your doctors (I swear my general practitioner is tag teaming with my Gyn) and watch The Biggest Loser success stories on a constant basis. The mind likes to learn, but that is only the first step. For me, it took 18 years to choose change. Not for the concept of someone’s ideal of beauty, but for my future health. I hopped onto the Weight Watchers train and became a regular at the gym with weekly jumps into Zumba, Pilates machines, treadmill and bike time. I became a planking diva and a new, stronger me metamorphosed. Then two car accidents at the end of 2010 knocked my focus away. My body felt like another body—injured, bruised and off course. Daily life became a balance of handling work responsibilities, making it to physical therapy appointments, trying to stay with my healthy eating choices, managing through chronic pain. I share this not to make excuses for going backwards, but to document for myself another example of the realities of life and that my weight loss journey isn’t something that will occur via a magic wand waved smooth transition. There are patterns that I learned in life that I consciously must work on to no longer repeat. There are moments when the thought of spending 45 minutes on the recumbent bike makes me want to crawl under my bed. I still mourn the loss of my beloved Zumba time. That is my reality and I’m okay with it. I’ve learned again to brush off the outside noise and let who I am shine through. That will not be my driver. The outside form does not define me. The beauty of one’s spirit shines from the inside out. Change is a process and I’m not perfect. My body is my body, and I am beautiful. 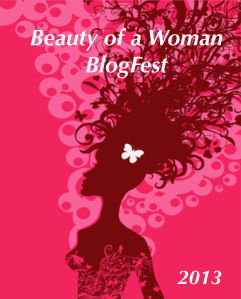 Make sure you swing by August McLaughlin’s fabulous blog tomorrow for her wonderful “Beauty of a Woman” Blogfest. Last year, over 40 people participated so you are in for a treat. This entry was posted in Healthy Living and tagged Barbara McDowell, beauty, Beauty of A Woman BlogFest:, exercise, finding self, taking care of self, weight loss. Bookmark the permalink. Hi Barbara! I also wrote about body shape for the blogfest. I recently started Zumba and I would be really sad if I couldn’t do it anymore. It hasn’t changed by body shape or size at all, but I do enjoy it and I know that exercise is healthy even when all we want to do is crawl under the bed and eat cookies. P.S. If you hadn’t written your story here, I would have never guessed because you always come across as a strong, dancing, planking confident woman! Barbara, I think you are absolutely beautiful. I’m with Nicole…if you hadn’t outed yourself that your weight is an issue, I don’t think I’d have known. And you’re right, people grow silent on this issue, and do the opposite when you take off weight. It makes me sad now that I’m thinking about it. You’re right, food is certainly an addiction, and one we don’t often talk about. But what I love most about your post is in your can-do, roll with the punches attitude. I have no doubt your new exercise regime will result in a stronger, healthier you – and that’s where the real beauty is. I struggle with body image regularly. I say I want to change things to be healthier – and I do – but it’s also that feeling of never being “beautiful”. And I know it’s distorted, because when I was thin, I thought the same thing – that I needed to change to be pretty. Lose weight, have different hair, etc. I love what you say about “patterns”. It’s definitely something I need to work on. Hugs to you – you most definitely ARE beautiful! I hate hear you’ve struggled with body image too, Amber. Hugs right back to you beautiful lady! I never struggled with body image — until I turned 45. Suddenly, things are sticking to me. I’m not digging it. But that doesn’t mean I don’t think I’m beautiful on the inside. And ultimately, we are so much harder on ourselves than others. Great post. You are right on, Renee, on how we are harder on ourselves. Yes, you are beautiful on the inside regardless of what the outside looks like. Life changes our metabolisms and adds some lines, but we are who we are in spirit until the end. How many of us struggle with body imagery? How many of us lose weight only to have an accident/illness take over our very being and side line what we did to keep the weight under control? I am sure the number is staggering. Thank you for sharing your own heartfelt words. Beauty is not the body image. Too many of us struggle with an excess focus on weight, Kathryn. Thanks for sharing your kind words. When I was younger I did not have a problem with weight, but between school, work, and home life, I began to make bad food choices and not exercise as I used to. I totally get what you are talking about. But as long as you get back on track to a healthier lifestyle, that is all that matters. I don’t know if I will ever be the size I was in my early twenties, but what is important that I can run a 5k, play tennis and do my kickboxing exercises with no problem. Great post, Barbara. it sounds like you will find the way that works for you. Bad things bring great perspective don’t they. You are beautiful! “Bad things bring great perspective.” And how, Catherine! May we all find our way from the bumps of life. It breaks my heart when people are so cruel, even when it’s unintentional. One beautiful thing that derived from my eating disorder recovery was the ability and tendency to not judge anyone by shape or size. I don’t draw comparisons, and I look at the person. The more we celebrate and fixate on weight loss, the less we emphasize or enjoy what matters. As a nutritionist I know that letting go of those fixations (and not dieting) also makes way for greater health physically. Thank you for this honest, insightful post, Barbara. You are a TRUE BEAUTY, inside and out, and I love you exactly as you are. So glad you joined the fest! “The ability and tendency to not judge anyone by shape or size.” So true, August! When we look at others, we have no clue of their story and can miss so much if we fail to see and get to know them. You are a beautiful spirit for your compassion and give back to others from where you have been in life. We are all better for it. PS. I was just downtown last week and thought of you as I wandered a bit in Public Square and looked up at our tower. So glad we had a chance to meet and for you to see some of the delights my city. Dear sweet Barbara, you are gorgeous! Fantastically wonderful and full of life. You know, I never thought about being overweight and drug addiction like that, but you’re so right. Getting older and recovering from surgeries isn’t as much fun as it sounds. So it’s time I figure out what I was getting out of staying overweight and create a new reality where I embrace being healthy. That’s scary. It’s so much easier to hide behind the weight. Looking at it like an addiction makes it really hard to honestly answer what I’m getting out of staying overweight. I’d never tolerate drug or alcohol abuse, I wonder why I’m so lax on food? Intriguing post that’s obviously got me thinking! Thank you for being such a positive, beautiful woman in my life. I’m sitting right beside you, Tameri. I know “hiding behind” it is what I originally did get. Now it is more of a bad habit crutch versus need. It is easy to put everything else first, but I wonder what is still left to hold me to the patterns. Thank you for your kind words and support over the miles between us. This is a courageous, honest post, Barb. Life throws stumbling blocks into the paths of our goals on a regular basis. Two car accidents in a short space of time? I’m amazed you have continued to shine as brilliantly as you do and I am SO looking forward to finally spending time with you in Atlanta at the RWACon! Dance on, girlfriend! Thanks, Patricia. During the hard moments, what I knew with my head didn’t match what I felt in my heart. So I took time to acknowledge that and my spirit could then take steps forward. I feel sad for all women, including myself, who feel their bodies failed them because they are imperfect. We need to remember our bodies are what they are. It is societal and cultural expectations that failed our bodies. I’m at a women’s writing retreat this weekend and heard a wonderful story about a woman at a senior center who wrote a thank you letter to her body. She realized how hard she’s been on herself and how her body has held up and done right by her over all the years. Such a deep appreciation. Change and body image is a given. Age alone is always changing the limits of what we can and cannot do. At youth, aging allows us to more and then at a certain point, we can do less. Our skin tightens, the loosens. Hair changes color, texture, style. Put in another way, our bodies encapsulate the change that life it is. To embrace change is to embrace the beauty of our bodies. Very thought provoking post. Thank you for sharing your comment, Sabrina! Thank you for this post! I joined the blogfest kind of on accident, but also wrote about body image. I also understand all too well about love of food and how addicting it can be. I also put some weight back on the last few years and have just recently gotten my nutrition back on track. I used to run quite a bit but last summer took up biking because it was easier on my joints, and oh so much more fun for me than running. I also used to Zumba-I can see why you miss it! It was so much fun! I appreciate you sharing, Sue. Also great to hear your nutrition focus is revamped. “My body is my body and I am beautiful.” I love that, Barbara. I am in need of a new mantra and I like this one. As I’m nearing my 3o’s, I can already tell my body is reacting to things differently. It’s hard for me since it’s new, but I’m learning to embrace it! Barbara, I felt like I could have written this post. The ups and downs of weight for me after major life events like having a child or major depression or the death of my mother..and losing myself along the way to try and find myself again. Weight Watchers is what worked for me too. And I’m battling 20 lbs gained back. I know I’ll never be thin – but I want to feel comfortable in my skin and I think the definition of that is different for everyone, right? And I think if we feel comfortable in our skin then our confident beauty does shine from the outward in. When I feel especially fat and dont want to go out to public events, my one good friend gave me good advice…she said “If you dont go out then you can stay home and be fat and it wont matter, right?” Blunt but true! Bravo to you for finding your beauty in whoever you are and for continuing to find it thru life changes. Thanks for what you shared, Donna! Yes, it is about being comfortable in one’s skin far above scale numbers or clothing sizes. Thank you for sharing and being open and vulnerable, Barbara. I’m sure it will inspire lots of people. 🙂 We can be our own worst enemy when it comes to real change and commitment. So many times I tried to eat healthier, but it only lasted two weeks or less. Busyness and life got in the way, and when I talked to other people, they made the process sound so easy. I’m reminded of a Kaiser commercial where this woman goes to like three different exercise things and washes out, until she finds something suited to her that works. It’s that finding what works for us and motivates us that’s the real challenge. You are so right, Angela. It is finding the spirit to continue on to find what works and self-acceptance along the way. Thanks for your supportive words. I love this post, Barbara, but I also love your comment above: I get now that the strength and power I developed in 2010 never left. I’m 60 years old and a whole lot less skinny than I used to be. The gradual middle-aged spread, exacerbated by struggles with my thyroid, bothered me for awhile, which took me by surprise. I had always had a rather matter-of-fact relationship with my body. It was what it was, and we got along fine. Until I gained 50 pounds. I too have discovered Zumba. I didn’t really lost much weight but I did go down one clothing size (I’ll take that!) I’ve been stable at that level for over two years now, but I know my body is as strong and powerful as I can get it. And knowing I’m doing the best I can to keep it that way means I’m in control. I feel stronger and more powerful inside as well. Keep dancing every morning, beautiful lady! Love this, Kassandra! The pounds I lost didn’t get me stick thin, but had me with wicked core strength and endurance I hadn’t had in years. Being in that healthy place made me feel powerful and proud of all the work I’d done. Love that you’ve found what works for you. Exactly, Kourtney! Keep on trying and change comes. Thanks for commenting! “I am a WIP.” Love that, Kim! Me too and I can so relate to the winter layer. Sounds like you are in a good place for mind and spirit so the physical part will work its way in. Best wishes for your forward movement towards balance and health. When I look back to when I felt best about my body, it was when I was very active. I looked better, but I felt better then too. Somehow, as you say, life gets hold of you and it’s hard to make time for that activity. Oh my goodness, Julie, Tina Turner is one of my idols! From her humble beginnings in Tennessee to her stardom and talent to reinventing herself after surviving abuse to dancing in wicked high heels for over 50 years. And you have it that it is feeling beautiful first–getting to that healthy mental place–before reaching for external gratification. If unhappy, losing weight or winning money or finding a fab new job won’t erase what is at the core. Thanks for your comment! Oh, wow. I never thought of that, and you’re absolutely right. People will talk about you (me) and your (my) weight, but not to you (me) about it. Holy crap, that’s got me reeling – in a really good way. I love how you’ve embraced how your body is now; how you recognize its beauty. I have a desire to apply that to myself, but the desire is quelled by a possibly-irrational fear that if I do, I won’t continue on my path the a healthy weight. More work to be done, and I’m okay with that. I have had thoughts like you, Ellen, that if I’m okay with myself now then I won’t strive for something healthier. What is helping me is going to the core of my concept of “healthy.” I also get that seeing myself more positive now makes me want to take care of the body I love. Thanks for you comment! What a great blog, Barbara. I love this post and was moved to see that the person writing the letter of appreciation to her body resonated with you, too. Your fiction is so polished and fine that it sparkles and flows like clear running water. Reading this post, I can’t help but think you should also try your hand at essays! That’s me, always recruiting. BTW I had a January like you did, and honestly, so many others I know did, too. Blessed sunshine today! I actually walked to the library! Be well and keep writing. I am touched by the beauty and depth of your reply, Marsha. Thank you for your response to my fiction and blog post. Funny that I tried my hand at personal essay about a decade ago and they weren’t emotionally home if that makes sense. I needed to do some self work to get the writing grounded. I will definitely check out flash non-fiction. Wow, this was really raw. I guess we all need to be patient with ourselves, but its easier said than done. Your writing is very engaging, I’m glad I stopped by. “A funny thing happened on the way to gaining the weight—everyone got silent.” This is my favorite line because it is so true. Even though I’ve lost an extreme amount of weight myself, I find it difficult to initiate a conversation with someone about weight loss. I think it’s literally the elephant in the room that everyone finds hard to discuss. A person’s weight is out there for everyone to see. Recently, I spent the weekend with some friends. The husband has a weight issue. He and I had some honest discussion because he asked me about my journey. Once someone opens the door it’s easier to walk in and sit down. There were some rather tense moments when he back pedaled, made excuses, etc. But I recognize those because I have had them all. At the end, he said to me, “Thank you. You are a really great friend because you are not afraid to tell me I’m fat.” I never once used that word but I understood what he was saying. I refused to ignore the elephant in the room. “Houston, we have a problem.” Instead of ignoring it, why not reach out a hand to listen and hear what others have to say? Thanks so much for sharing your journey. It took a lot of courage to post this. I commend you, not only for writing this post, but for the journey you’ve traveled and are still traveling. God bless you.